How Long Will the NRC Keep North Anna Shut Down? The short answer is: The North Anna nuclear power plant in Virginia will remain shut down until the NRC is satisfied the plant’s operator, Dominion, has proven the plant’s two reactors can operate safely. The NRC’s been examining both the plant itself and Dominion’s response to the Aug. 23 quake ever since the event itself – one of the agency’s resident inspectors was in the plant’s control room when the quake hit. We supplemented our residents with an Augmented Inspection Team the following week, and that team discussed its preliminary findings Oct. 3 at the plant. The team concluded North Anna shut down safely after the quake, despite the plant having faced stronger shaking than what was anticipated during its licensing. The team examined Dominion’s work and conducted its own inspections, all of which showed only minimal damage to a few of the plant’s systems. Another group of agency experts from the agency’s headquarters and Region II office in Atlanta will continue the North Anna inspection effort next week. 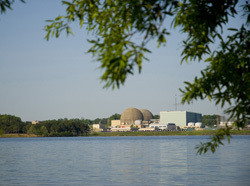 In order to most effectively review the information on North Anna, the NRC’s Office of Nuclear Reactor Regulation has set aside headquarters staff to focus on the issue of plant restart. The NRC met with Dominion Sept. 8 (see the meeting’s webcast), where the company laid out its rationale for restart and the NRC staff asked questions in several technical areas related to restart safety. Dominion started to answer those questions with information on Sept. 17 and 27, but there’s more work to do. In particular, the NRC wants to ensure Dominion has done an extensive set of inspections – a lesson learned from experience at a Japanese reactor damaged by a 2007 earthquake. The NRC also wants to ensure Dominion has appropriate plans for monitoring the plant during and after restart. Once all the NRC inspections are done, the staff’s questions are properly answered and we’re satisfied it’s safe for the plant to restart, the NRC will write up a safety evaluation documenting why it’s appropriate for North Anna to restart. The agency expects this entire process will continue past Oct. 21, when the Commissioners will hold a public meeting to discuss the North Anna situation. My apologies for the delay in a response. There are at least two videos of North Anna briefings to the Commission available on this page: http://video.nrc.gov/ from Oct. 11 and Oct. 21. I’m afraid I do not see a video in the archive for the date you cite, however. Dominion’s inspections of structures inside the Unit 2 reactor, as well as a significant sampling of Unit 2 fuel assemblies, provided enough information to conclude the Unit 1 fuel would be in the same condition as Unit 2’s fuel. Unit 1 fuel needs to be inspected too. Look at it this way: it will take less time to make sure the plant is safe than to clean up after a meltdown! @Moderator – Please tell us what the North Anna Unit 2 Reactor Trip Root Cause Analysis concluded. Although the condition described in the GE Control Blade-Seismic issue is not applicable to North Anna, I am very interested in what exactly tripped the North Anna Units. Since Unit 2 is/was removing its reactor vessel head for refueling, I would hope they have a chance to examine the Gripper Extension shafts for signs that some of the control assemblies “shook” loose during the quake. Two or more control assemblies of high rodworth falling into the core, would be enough to actuate the Power Range NI, 5% Negative SUR trip (5% in 2 seconds if my memory serves me). The extension shafts are inside their housing which are attached to the top of the reactor head. Perhaps some shaking on these somewhat unsupported columns have allowed enough play to allow the holding gripper to open. Just a thought . . .
At the North Anna VA reactor of Dominion Power how many inspections of foundation materials made during construction phase of the reactor silo’s for seismic disturbance? Were there any fractures in the concrete of the containment structures or floors of the facility? Is the underground piping infrastructure being examined for damage, if so has any damage been noted? Has there been any damage to the reactor facility which has been discovered as a result of the earthquake? Your answers will be appreciated, thank you. North Anna is built to a Westinghouse design, therefore the GE control rod issue does not apply there. All GE-design plants in the U.S. have already compensated for the condition GE described and their control rod systems will work properly if an earthquake occurs. Since North Anna is the first operating U.S. nuclear power plant to experience stronger shaking than what was anticipated during its licensing, the NRC is ensuring Dominion’s actions are appropriate. The “first of its kind” factor, combined with the experience of a Japanese reactor requiring extensive inspections to determine its earthquake damage in 2007, calls for a proper examination of North Anna to ensure the plant is safe to operate. North Anna is the first operating U.S. nuclear power plant to experience stronger shaking than what was anticipated during its licensing. In 1986 the Perry plant in Ohio exceeded its “design basis earthquake” while under construction but was found acceptable for operation before its license was issued. In 1979 the Summer plant in South Carolina exceeded its operating basis earthquake (half of the design basis) while under construction but was found acceptable for operation before its license was issued. Did you prepare really versus natural accidents such as Fukushima Tsunami ? For exampl, how long would it resist a major earthquake ? Only lessons learned in 2007? Would not it be time to consider the sudden ignition and firestorm in the core of the zirconium-steam reaction? Or there is still a question that this is the key process, causing the final state of nuclear reactor fuel in the TMI-2 reactor accident, Chernobyl-4 reactor accident, Paks-2 washing vessel incident and in the Fukushima Daiichi 1, 2, 3 reactor accidents? Is this the first instance of a US nuclear power reactor experiencing a quake of greater intensity than its design basis? If not, when was the previous occasion? Excessively P.R. Picky or stalling and stroking nuke frets and misgivings? Really, how long would’ve feds taken to get a similiarly “damaged” oil or gas facility back on line? Didn’t Diablo Canyon jump back on the grid while other conventional plants were still picking themselves up after their last quake? Is there a publically available transcript or archived video of the AIT public exit meeting held on October 3? In response to this article that warns that there could be a shift in the alignment of the shaft used for control rods inserted to shut down a reactor in an emergency such as the earthquake North Anna experienced what is the NRCs solution for this problem?